Up to 20% less than other brands! Helps calm and soothe babies in distress and during painful procedures. Priced to save your hospital money! ensure it’s bacteria and mold-free. Convenient vials administer just a drop at a time. 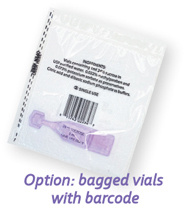 Translucent, purple-tinted vials indicate "oral use"
Contact us for Samples, Evaluation Kits & Quotes. Vials containing 1ml or 2ml of 24% sucrose in USP purified water. Latex-free, DEHP-free, BPA-free. Manufactured in the USA. Vials containing 1ml or 2ml of 24% sucrose in USP purified water. 0.022% methylparaben and 0.073% potassium sorbate as preservatives. Citric acid and dibasic sodium phosphate as buffers. Costs less than other preservative-free sucrose solutions. US Pharmaceutical-grade sterile, as regulated by US Pharmacopeia. Contains no preservatives or additives. No irradiation. Each lot passes USP <71> for sterility. We collaborated with an independent testing lab to determine the preservatives necessary to ensure Preserved SweetUms is bacteria-free. SweetUms's preservatives are found in Ora-Sweet�, Gentamicin, Caffeine Citrate, and other products commonly administered to preemies and full-term babies. Passes the Tests for USP Preservative Safety Effectiveness! Formulation tested in accordance with USP Preservative Effectiveness Tests (27 NF 22 2004 USP <51>). Results meet current USP criteria for Antimicrobial Preservative Effectiveness. Two-year shelf life in unopened containers. Single dose, single patient use. Administer by drop using vials. Each drop is approximately 40 �l (microliters). Tip allows controlled administration directly to tongue or buccal surface. Always follow your hospital protocols for sucrose use. Just a couple of drops on a pacifier or on the tip of the tongue, a few minutes before a painful procedure, are sufficient. Vials may be recycled with other #4 plastics (LDPE). Need a Protocol for Sucrose? email us at orders@sandboxmedical.com or to share your protocol. Soothie® is a Registered Trademark of Children’s Medical Ventures, Phillips. GumDrop® is a Registered Trademark of Hawaii Medical LLC, Natus Medical Inc.
JollyPop® is a Registered Trademark of SandBox Medical LLC.